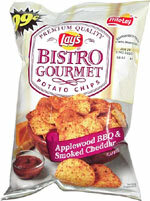 Taste test: I was skeptical when I first heard about these because of their association with Lay's, but the taste has proven me wrong. These are very good chips. They've got a nice cheddar taste, combined with good barbecue flavor. The chips are thicker than regular Lay's, and they're more irregular too, with most having one or more large air bubbles in them. There's a lot of flavor on them. When you first start eating, the cheddar is more noticeable, but after you eat several, the barbecue kicks in. It's very hard to stop eating them. There's a good, slightly hot, barbecue aftertaste too. Good stuff! 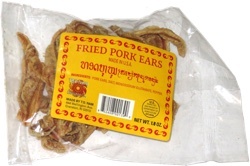 Smell test: These have a good cheddary, sort of barbecuey, smell.